After manager Mike Roberts hinted at a possible fight over the weekend, it didn’t take long for Chael Sonnen to formally call out Michael Bisping himself. The controversial middleweight sent an email to UFC matchmaker Joe Silva on Monday requesting a showdown with MMA’s newest bad boy. After clowning Bisping in a few pre-fight videos, Jorge Rivera was well aware he’d be facing a motivated Brit at UFC 127. However, walking away with a 2ndRound TKO victory simply didn’t satisfy “The Count” on Saturday. As if circling back to taunt his defeated opponent wasn’t enough, Bisping did so after making a beeline for Rivera’s corner and spitting in their direction. Sonnen is currently facing a maximum of 20 years in prison and a $500,000 fine after pleading guilty money laundering in January. If his March 28th sentencing goes according to plan, Sonnen will cop a plea and only have to fork over $10k and be placed on two years probation. He’ll be eligible to return to action after March 2nd when his six-month UFC 117 drug suspension expires. 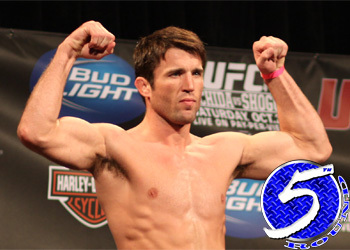 However, the 33-year-old was placed on a temporary ban by UFC president Dana White after his legal woes surfaced. Speaking of cracking the whip, White told MMAFighting on Monday Bisping would also be disciplined for his deplorable antics. White did not specify what the punishment would comprise of.